'']] Reimerswalde (now known as Leśnowo; coordinates: 54.224951, 19.073081 [54° 13′ 29″ N, 19° 4′ 23″ E]; population in 1905, 188) is located approximately 3 kilometres (2 miles) west of Nowy Dwór Gdański ([[Tiegenhof (Pomeranian Voivodeship, Poland)|Tiegenhof]]), 21 km. (13 mi.) north of Malbork ([[Marienburg (Pomeranian Voivodeship, Poland)|Marienburg]]), 21 km. (13 mi.) north-west of Elbląg ([[Elbing (Warmian-Masurian Voivodeship, Poland)|Elbing]]), and 33 km. (21 mi.) south-east of the regional capital Gdańsk ([[Danzig (Poland)|Danzig]]). Thiessen, Richard D. "Reimerswalde (Pomeranian Voivodeship, Poland)." Global Anabaptist Mennonite Encyclopedia Online. November 2012. Web. 25 Apr 2019. http://gameo.org/index.php?title=Reimerswalde_(Pomeranian_Voivodeship,_Poland)&oldid=96194. Thiessen, Richard D. (November 2012). Reimerswalde (Pomeranian Voivodeship, Poland). Global Anabaptist Mennonite Encyclopedia Online. 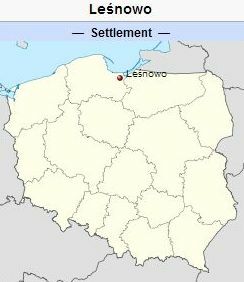 Retrieved 25 April 2019, from http://gameo.org/index.php?title=Reimerswalde_(Pomeranian_Voivodeship,_Poland)&oldid=96194.